My card today is one I made for an organized swap at OnStage in April. As I have posted previously, I was a Display Board stamper for this event, so I had brand new products to play with and share with everyone that attended OnStage in London, Ontario. I wanted my card to be extra special, and one that would show other demonstrators some of the new products and give them a jump on creating their own new cards. I love the new Animal Outing stamp set and coordinating Thinlits Dies, so decided to use them for my swap card. The animals are so cute and the ones in this card are no exception! I decided to give the people in the swap a card, and a bookmark. I tried to design my card so that even if they were using their bookmark somewhere, the card would still be interesting to look at. This also gave me the opportunity to show them another die cut in action! Does this leafy die cut look familiar? It is very similar to the very popular Paper Pumpkin kit from December 2017. All good things come around again. 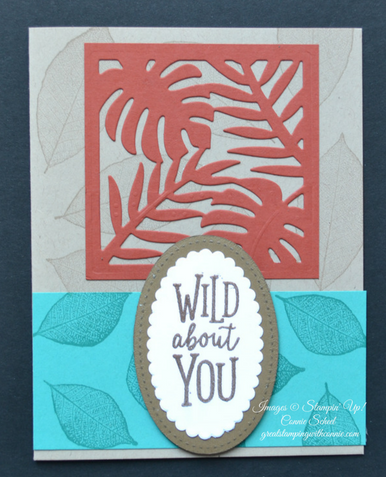 I used the large leaf stamp to stamp tone on tone in Crumb cake on the card base, and the smaller leaf for tone on tone in Bermuda Bay on the pocket. I didn't know about the colour revamp when I made this card, so I'm happy that all the colours I used are still available. My sentiment is embossed with Copper embossing powder to coordinate with the Cajun Craze and Soft Suede in my card, and the Copper ribbon on the bookmark. I coloured the kangaroo and koala with our Stampin' Blends. I'm so glad they are available again, and new colours are coming soon too. If you don't have yours yet, you can order them here. Everyone that received my swap card was very excited to have a sample of some new products, and I was really happy with the outcome.